Labor forces are planning the largest rally in decades—their latest effort in an uprising against low wages. On April 15 these workers will join their voices to demand a $15-per-hour living wage from rich industries that they say are pinching pennies on salaries. The Fight for $15 movement burst onto the scene in late 2012 with several hundred fast-food workers. Three years later, the 2-million-member Service Employees International Union is spearheading the movement, according to the Associated Press. With SEIU’s involvement, the movement has drawn a range of other low-wage workers, including child care providers, retail employees and home health care providers. For 15 years, Thomas has provided one-on-one care to elderly patients in their homes, from morning to night, at least 16 hours a day. She’s highly trained to handle health care emergencies, follow through on physicians’ orders and even provide basic physical therapy. Yet she earns just $10 per hour, without overtime and no health care. 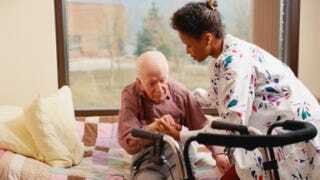 The grievances seem quite legitimate, since revenues in the home health care industry increased 48 percent in the past decade, according to the National Employment Law Project (pdf). Yet hourly wages for workers have declined when adjusted for inflation. At the same time, executive compensation has risen sharply. The U.S. Department of Labor projects that the home health care industry will expand five times faster than other occupations, but wages are not expected to budge. This disproportionately affects women of color—who make up more than half the workers in this field, according to statistics from the Paraprofessional Healthcare Institute. But that’s not surprising, the institute says, because the devaluation of these workers is “rooted in the history of exploitation of labor based on race and gender” (pdf). Thomas cannot make it to the April 15 rally, but many home health care workers in her circle do plan to attend. “Many of my patients are standing with me,” she added. Her patients and their families appreciate her hard work and dedication, and they’re outraged by the wages that the home health care agencies pay her. Thomas is optimistic that the agencies will also come to appreciate their workers and pay them a living wage. Nigel Roberts is a New York City-based freelance writer. Follow him on Twitter.